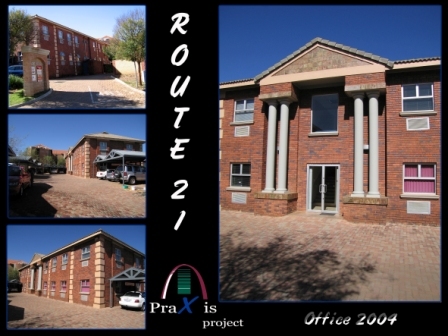 PraXis Projects is a construction company and operates as Contractors, Developers and Project Managers. In September 2000 Gerhard Joubert and Nico de Lange left Bird Construction as directors after more than 12 years service and floated a construction company namely Praxis Projects. Since inception we carried out various projects covering the spectrum regarding retail, housing and offices. Gerhard has a vast experience in all aspects pertaining to numerous contracts. Partner in PQS practice Commercial Director in major construction company. Nico worked for LTA as site foreman and ended as director with a major Construction Company responsible for the completion of major projects. Some of his clients were FNB, Sanlam, Old Mutual and Caltex. Both members are personally involved in all projects. We offer our clients a quality service. We are a dedicated team who takes responsibility and accept accountability. It is the objective of the company to train employees in all aspects of construction. We therefore send the employees on a regular basis for training in erecting of scaffolding, concrete for the construction supervisor courses and in First Aid. The company policy regarding Occupational Health and Safety is to appoint an independent consultant to attend to safety issues. Currently we make use of Konsafe Measures CC (Tel: 082 775 2618, Contact: Kobus Buys). The company also ensures all insurance cover is in place. We are ensured by Construction and General Insurance Brokers for Contactors all risk and SASRIA. Our policy number: 44210064865/5. We are covered for employee injuries on duty by our policy with FEMA (Nr: 203088 and WCC Ref nr: 2770-056-FEMA). Concrete: Test cubes submitted to SNA Lab for testing on regular basis. All earthworks to be inspected by appointed engineer. Brick samples tested for Mpa strength. Slabs certified by independent engineer. Roofs certified by independent engineer. Formwork and scaffolding all SABS approved.